Life will wake you up and and remind you of how fast things can change. On December 30, 2017 I had such a reminder. I’ve spend a good portion of my life hiking up streams, mountains, ice, snow and the list goes on. I hike in the dark and pre dawn hours. I feel at home skipping off rocks while I cross a stream. I have good balance and feel comfortable doing all these things while carrying my camera gear. Today I took a fall. Not off a cliff, but while I was crossing a stream back to my car, just 100 feet away. It was something I have probably done 1000s of times. Today my number was up. At 2pm I headed out to do some recon for future shoots. I had just moved to Merlin area of southern Oregon a little over a week ago. I was excited to get the lay of the land from a photographers perspective. 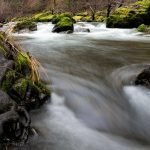 I Drove down the Galice Road along the Rogue River to Grave Creek Bridge. A point of no return into the wilderness and wild river area. I planned on finding interesting waterfalls, barren trees and more. This is the place where rafters cascade down into class III and IV rapids of the Rogue. I found a nice place along the road where I could see a set of rocks with bright green moss and a good looking flow of water. It was a smaller creek called Graves Creek. Grabbing my camera and placing it on my tripod, I made my crossing of the creek to get to my intended shooting spot. Gathering a number of images I returned to the crossing. The rocks seemed especially slippery. I had faced this before. So, with caution and using my tripod as a stabilizing pole, I made my way across. Leaping on to the far bank my world spun out of control. I staggered forward twice, too late to stop the inevitable. Falling face down, tripod and camera in hand, I landed hard. The final blow would have been to my face on the left cheekbone, but somehow I managed to get my left hand up to take the brunt of the impact. As if to accent the event, my forehead bounced off a rock just enough to stun me for a moment. All was quiet. I felt as if I would pass out. I tried to get up and immediately knew I needed to stay down. On all fours I took my jacket off. I was now sweating, in a panic and light headed. I laid down on the jacket with my legs elevated. Looking up at the sky. Utterly alone. Of course I thought about my camera. But I could see it was still on and working. A slight ding in the polarizing filter. Now I checked me. Nothing broken, no bad bleeding. After about 10 minutes I felt well enough to rise up and get back to the car. Driving the nearly 40 minutes back to the Family Farm just outside of Merlin, I thought about my habit of hiking in Arizona and other places with my camera on the tripod ready to go. I needed a new strategy for Oregon and a way to work that would help me be as safe as possible. A few beers for my nerves, some dry clothing and I was ready to tackle an article on safety. This is just as much for me as for you. I am not invincible, nor getting any younger. It is now time for a new mode of operation for the landscapes of the pacific NW. I thought about my Fall hike up the Narrows of Zion National Park. We had water shoes/boots, a hiking staff as well as quick drying pants and thermal underwear on. The camera was always in the pack and the tripod lashed on as well. The camera was protected and your hands were free. Using a strong wooden hiking staff, 5 to 6 feet tall, allows you to brace yourself when your feet slip. Slip they will as you are often blind to exactly where your feet are landing under the water. 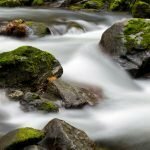 Placing your staff down stream and leaning on it as you cross or hike up the stream helps tremendously. Don’t use regular hiking poles, they can get caught in the rocks and snap off. I use hiking poles for trail hiking and the occasional creek crossing. A sturdy pole kept me from falling down several times as my feet encountered unseen slippery rocks. Get a good pair of hiking shoes that you can use in water. I have some of those hiking sandals and have used them many times. But they don’t afford good protection for your feet. Having good foot protection and extra socks will help. Keep more in the car for your return. Taking the time to change to your water shoes/boots for crossings will help keep your feet dry while not in the water. This brings up hypothermia. It is amazing how cold you can get having your legs wet for long periods of time, in or out of the water. Wind can evaporate the water off of wet pants and cool you even faster. If you plan on being out for more than a short time, think of bringing dry pants to change in to when not crossing a creek or if you start to get cold. A change of clothing in the car is a must as well. Always take the time to put your camera and your tripod and other gear away before fording a creek or river. This will protect your investment and keep your hands free for the hiking staff and balance. I even have plastic bags that my camera, lenses and other gear go into while inside of the camera bag. I know your camera gear is valuable and important to you, but your life is worth more. Don’t be afraid to let go and shed the pack if you have to. It can be replaced. You can’t! Don’t lose your life trying to save your gear. While fording a creek or river it is important where you cross. Even 4 to 6 inches of water moving fast can take you down and cause you issues trying to get up again. Don’t cross just above a set of rapids or a waterfall. Be a safe distance upstream or downstream, giving you time to get to safety if you do slip and fall. Loosen you pack straps and even unclip the waist belt incase you need to shed this fast if you fall in. It is good if you find a spot to cross the has branches and things you can grab on to if you get washed downstream. But avoid areas where you could get washed under a bank or log. Of course, slower moving water is best. Much of the above recommendations are also true for hiking steep embankments, trails and scrambling over rocks. Safety first. Purchase the best outdoor clothing you can afford. It is often lightweight, works best in extreme elements and will last you a long time. This is true of cold, wet, or hot weather. I know all this takes time to do. As impatient beings we want the reward and to get the shot. We have little time to slow down and think of changing shoes, putting the gear away, and taking the time to prepare for even a short afternoon shoot. Having nearly “bitten the dust” (or rock in this case), I now have a strong reason and reminder to slow down, prepare, then go enjoy my time out shooting. Also, let someone know the area(s) you will be and approximate time you will return. Go with someone so you are not alone if you can. Cell phone service is sketchy or non existent in many of the areas I go. So don’t count on that. Once back in a cell service area, let that person you let know of your plans that your are on your way back. I often go alone and have for many years. At 63 years old, I need to take more precautions and be better prepared. Finally, there are devices you that connect to satellites and can send messages out. From “I’m OK” to “SOS” and “HELP!”. Search online for PLBs (personal locator beacons) and Satellite Messengers. I plan on getting one in 2018. My friend Judy had one on a trip we took and was able to send messages of our location and that we where fine. I know there is a monthly cost and subscription. Think of it as insurance. It is easy to get cavalier and lulled into a complacent zone. We get comfortable. A false sense of security. We can easily be blind sided by nature and our own lack of paying enough attention. I spend the last 12 years hiking in the American Southwest. Loose rock, flash floods, lightning, cactus and rattlesnakes were the things we watched out for. That along with heat and the need for lots of water! Now I have a new terrain to explore that has it’s own dangers and hazards. It’s time to prepare for them. You will find me out enjoying my time outdoors with a camera. My preparations will become second nature and part of my routine. In the end we can only prepare and make the best decisions we can. I am not detoured nor afraid of going back out again. But you can bet I will be more aware and thinking about each move and process of getting on location. I don’t want to photograph what everyone else has. I am willing to take the risks to find interesting and fun images. Staying home is not an option. Besides, the house could burn down or I could fall on the stairs…. 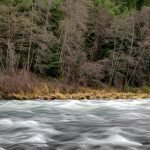 This entry was posted in Landscape Photography and tagged beacon, creek crossing, grave creek, photography, PLB, river crossing, rogue river, safety. Great blog and safety post. Very good safety suggestions. Difficult for my eyes to read the light gray type. Black would be best. Happy New Year, Larry! I’m looking forward to reading your 2018 posts. Thanks. I have darkened the text.